HEARTLAND | The kids have gone back to school, so now let’s go back to church. 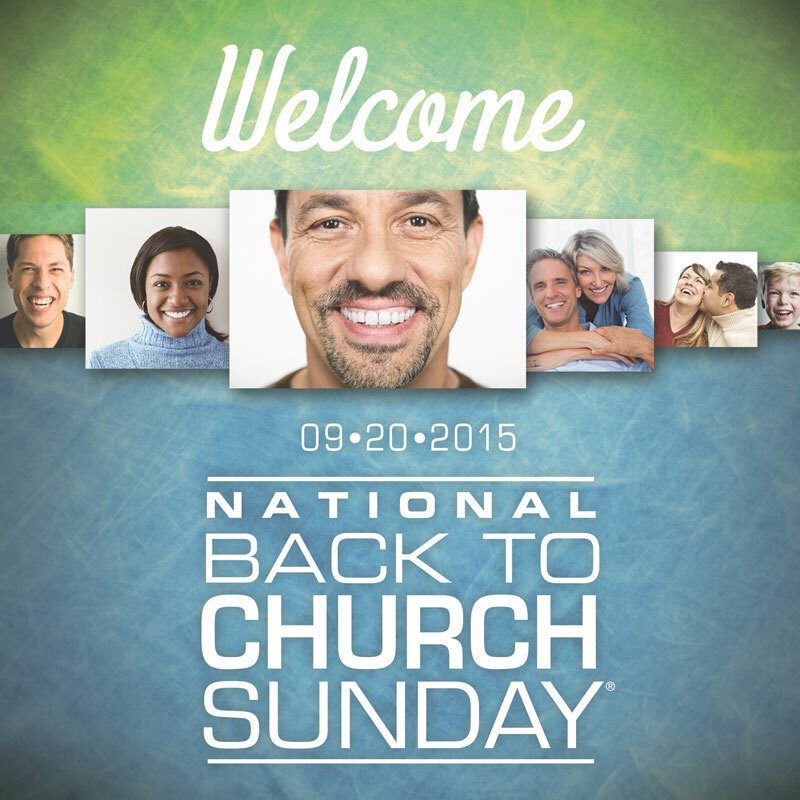 That’s the idea behind National Back to Church Sunday, September 20. After Labor Day is one of those times when the number of church visitors increases. How can we prepare? Smiles, everyone. Practice your greetings. Put it plainly: let’s make people feel welcome, not just at the assigned hand-shaking time, but before and after the service, too. Two-minute warning. As with the last moments of an NFL game, assign the greeting to the last two minutes of the service. Encourage people to stick around and talk, or invite the guests to lunch at a local restaurant. Check the signage. Invite a stranger to assess the effectiveness of the signs in your buildings, especially for the restrooms and children’s area. Paint the entryway. The rest of the place may need it too, but at least spruce up the lobby. Best face forward. Assign the friendliest greeters for the month of September in a variety of ages. Review the basics of making people feel welcome and giving directions. It’s January, and another “polar vortex” appears to be descending upon our heartland homes. Just a few days ago the temperature outside was flirting with 50 degrees. But then yesterday was barely above freezing, and as I write now it’s 16 degrees, heading for a low of 6 tonight, with wind chill temperatures that will require those dreadful minus signs in front of them. So instead I’m choosing to think about next summer, and I encourage you to do so too. Now, in the dead of winter, is a perfect time to start planning a summer missions experience. 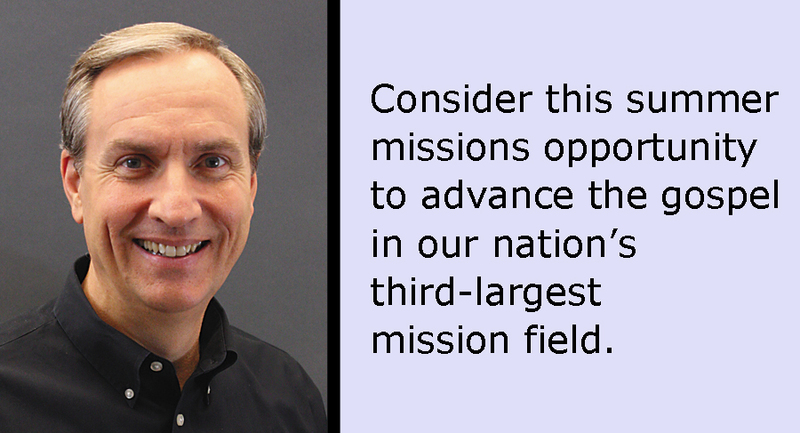 Your church may already have a plan for sending one or more groups on mission trips outside your own community this year. Many churches in Illinois have adopted an Acts 1:8 strategy, and are seeking to send mission groups to serve nearby in their local association, as well as elsewhere in Illinois, North America and internationally. These are modern day equivalents of the “Jerusalem, Judea, Samaria, and the Ends of the Earth” mission fields that Jesus spoke of in His last words on earth. e-mailing Rachel Carter (217-391-3101 or RachelCarter@IBSA.org). Even if you only have two or three who can go, they will be quickly welcomed into the larger group. During ChicaGO 2015, your group will be housed on the Judson campus there in Elgin, but during the days you will explore one or more of Chicago’s 77 neighborhoods or diverse suburbs. Morning training sessions and evening worship experiences will allow you to meet some of the dynamic church planting missionaries that are seeking to advance the gospel in our nation’s third largest mission field. And during the day you will work right alongside them, and alongside other students and adults from Illinois churches that share your heart for advancing the gospel there. Wherever you live in Illinois, ChicaGO 2015 is relatively nearby, and affordable. Planning and preparations for the week, such as meals and work projects, will have been done by IBSA before you get there. Participants can be both students and adults, and the environment is one that’s safe, and yet that will open your group’s eyes to the vast and diverse lostness that is Chicago. brutality of its icy grip. But there is also a whirling mass of people in Chicago that are in the icy grip of lostness. Many have never heard the true gospel in a way they can understand, or from people that care enough to meet them where they are. That’s why now, this winter, right in the middle of our polar vortex, is an ideal time to plan a summer mission trip. Perhaps you will join our church planters and me in the Chicago vortex next July. 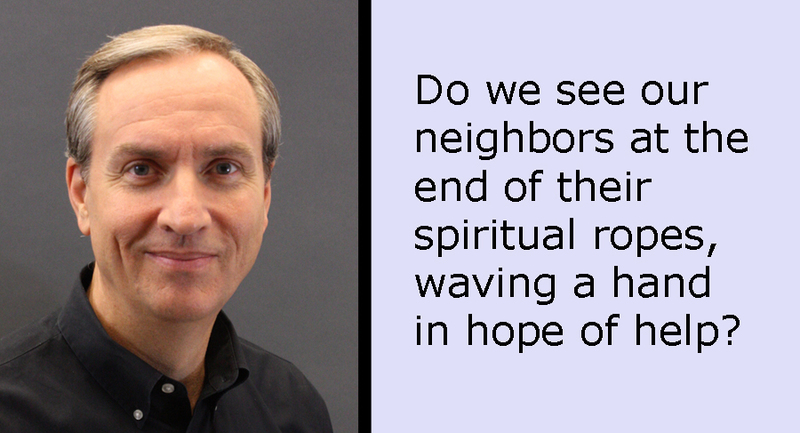 Or perhaps your church has identified a different vortex of lostness or two to enter. Last year more than 26,000 Illinois Baptists did. It warms my heart just to think about it. We have a fairly small front porch. We don’t spend much time there, partly because we live on a cul-de-sac, and our front porch doesn’t offer much privacy. It looks directly into the yards, and lives, of several other families. We spend much more time on our backyard deck. That’s where we can see most of our flowers and our garden. It’s where we grill during the summer time, and where we enjoy the privacy provided by a number of mature trees. Last weekend, though, our son Caleb brought over his lawn trimmer to see if I could help him make it work, since it used to be my lawn trimmer. When he arrived, I met him on the front porch, and for some reason we sat down there to work on it. Soon my wife, Beth, joined us, and noted that the only other person who seemed to be outside that beautiful Saturday was our neighbor who has cancer. Let me call her Cindy. Cindy was out tending to her beautiful front yard flowerbeds. Suddenly Beth exclaimed, “Oh my, Cindy just fell.” Caleb and I then looked up from our work, and saw Cindy lying on her sidewalk. But as we watched, Cindy just laid there for a few seconds. Then, with great effort, she raised one hand and began waving it slowly in the air. We all then sprinted to her side. Cindy was relieved to see us, and asked if we would help her try to get up. She had fallen on her hip. Our first, careful efforts to help her brought her so much pain that we all agreed we needed to leave her where she was and get some medical help. We found her husband inside, who called an ambulance and then scurried around to prepare to go with her to the hospital. It has occurred to me many times since that day how unusual and providential it was that we were even in a position to help Cindy. Like so many, we seem to be backyard deck people more than front porch people. And I have also been convicted how true that is spiritually, in our relationships with our neighbors. How many of the people we know are down and helpless, at the end of their ropes spiritually, and quietly waving one last hand in hope of help? Are we even in a position to see them? Or are we comfortable in our own backyards? Many of the people we know who have deep spiritual needs don’t even know what or Who they need. Cindy didn’t. She just suddenly knew she was helpless. But because we were in that rare position to see her fall, we were able to play a small role in getting her the help needed. This summer, let’s all spend more time on the front porch. Let’s look for the frail waves of the people around us. And let’s help them call on the One who can meet them right where they are. We may see their soft wave of gratitude in eternity. Looking around my middle school classroom in Springfield, I’m struck by how different it is than where I was eight months ago, surrounded by the beautiful mountains of eastern Kentucky. Or five months ago, when I was immersed in the bright and flashing lights of New York City. few months in Brooklyn, learning about ministry in an urban context. I came back home to Illinois in November and felt called to live out a personal dream: becoming a teacher. I received an exciting job offer to teach current events to sixth, seventh and eighth graders. My classroom isn’t as scenic as the mountains or the city, but it’s certainly a mission field. Going from a mission-minded environment to a secular workplace was a big jump for me. In many ways it was one of my biggest life challenges. I went from being surrounded by those who have the same eternal goal in mind, to working with people who have lots of different goals. I quickly learned that the “harvest is plentiful but the workers are few.” But God has given me opportunities to share the Gospel. One of the first things I noticed among my co-workers was that the environment in my school was very negative. I started writing encouraging notes to the teachers on my team as well as the administrative staff. My coworkers quickly took notice of that and sought me out to talk about their struggles. A before-school prayer meeting started up again. People are more positive now. I realized that sharing the Gospel starts with the small things, and God can take those small things and transform a school. The most valuable part of my job is getting to know my students and letting them know I care about their needs. Even though I’m not allowed to say, “Christ has a future for you,” I can give positive feedback and point them toward their strengths. One student recently was placed in my room for a behavior problem. He quickly got bored, so I gave him the simple task of fixing my three-hole punch. He liked that I gave him some attention and that he was able to accomplish this task for me. We’ve had a positive relationship since then, and he knows that I care about him and want him to do better in school. Even with the challenges this new workplace brings, I have been constantly reminded that Christ is in control, and that the real mission field lies in our schools and regular workplaces. People with needs are crying out and, for us who are Christians, being able to step into those places and bring the Gospel is an honor. Carrie Campbell is a member of Delta Church in Springfield.